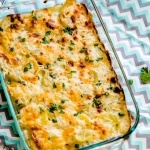 Creamy texture, hearty taste and cheesy rind are all we love about homemade scalloped potatoes. 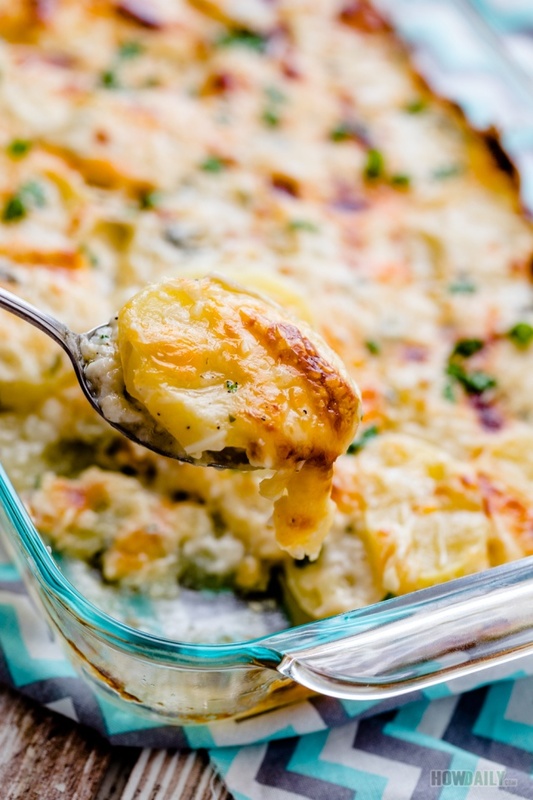 There’s always a place on our table for this delicious side dish. Try out our simple recipe on this favorite classic. 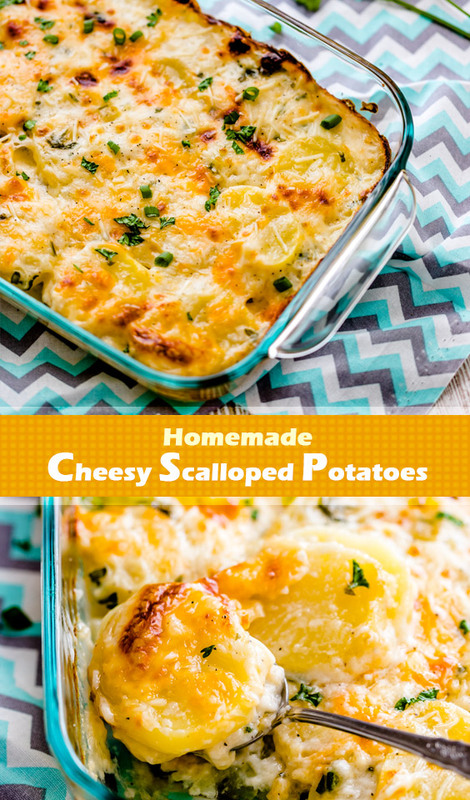 This recipe take potatoes at their rawest form, thinly slice then mix and bake with onion & cheese sauce. 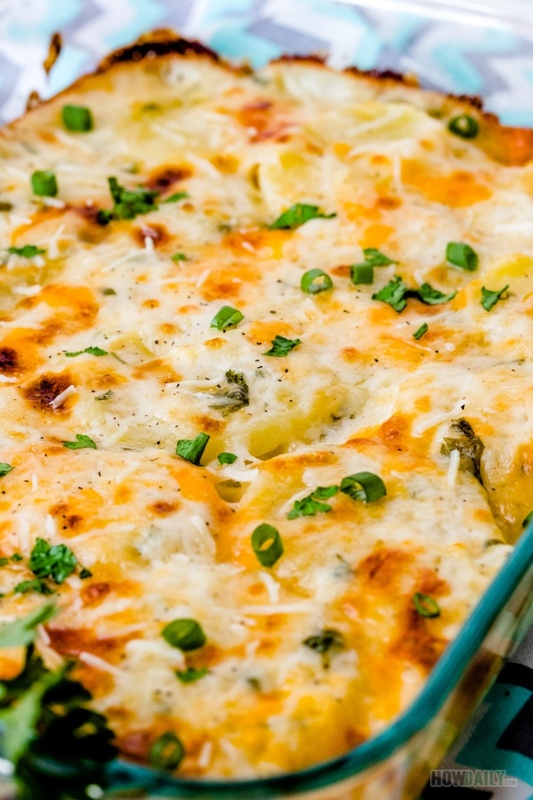 The final layer is topped with even more Parmesan to give extra cheesy bubbling. For those who can take gluten or dairy products, this dish will surely be one of best comfort food. However, you can always do substitution on any of the ingredients. 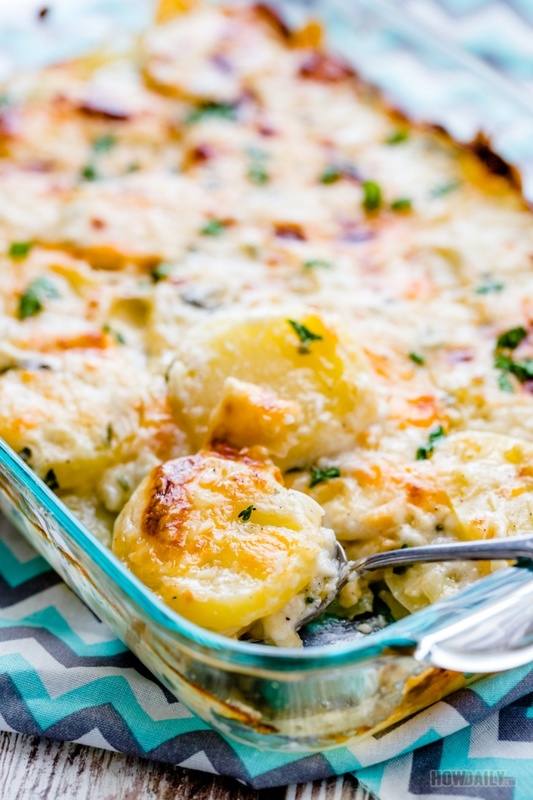 These scalloped potatoes work great as party side dish or dinner main carb. and can complement any steak, chicken, stew, etc. really well. Sprinkle on some shredded herb before serving to enhance the flavor. Prepare a bath of cold water, squeeze in lime/lemon juice. Peel the skin off of potatoes, submerge them in the above acidic cold water to prevent potatoes from turning gray while you're cutting/peeling. Rinse and wash all potatoes clean, then proceed to thinly slice them. You can also use food processor that have slicing capability to save time while control the throughout thickness. Whisk to mix milk and flour. In a large sauce pan over medium heat, melt butter then add crushed garlic and stir till light golden brown. Add sliced onion and saute to soften for about 5 minutes. Pour chicken stock in, stir to mix, bring to lightly boil. Add the mixed milk/flour and adjust heat to low/simmering. Now add salt, pepper and some herb to season the sauce. Stir to let the sauce simmer, with lightly bubble up, remove from heat. Prepare a baking pan or casserole dish, lightly spray its bottom to prevent sticking if need. Arrange two layers of potato slices in brick building sequence. Strain and spacing all the onion over potato layer, ladle over 1/2 the sauce and sprinkle on some shredded cheese here. Repeat with the other half potato slices, sauce and cheese. Wrap to cover pan with foil. Bake for 40 minutes then remove cover and bake for 10 -15 more minutes. When done, remove pan from oven, sprinkle on your favorite herb and let cool a bit. 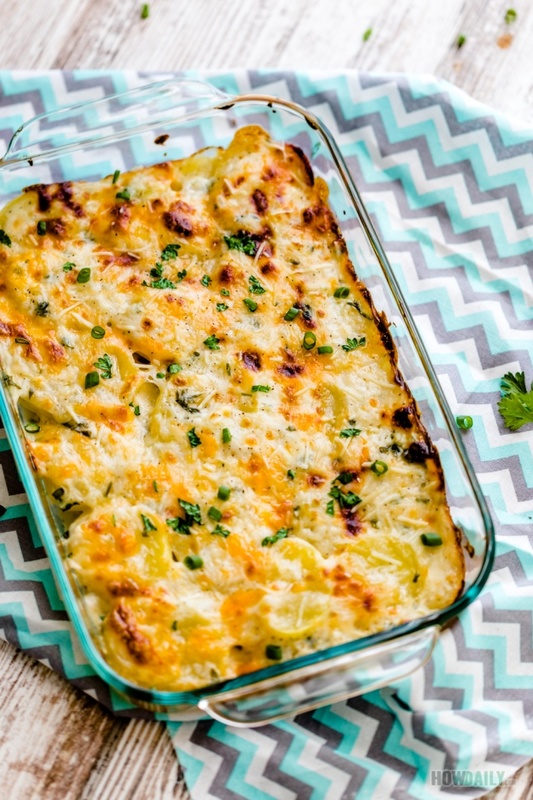 Serve warm with extra herb and cheese.